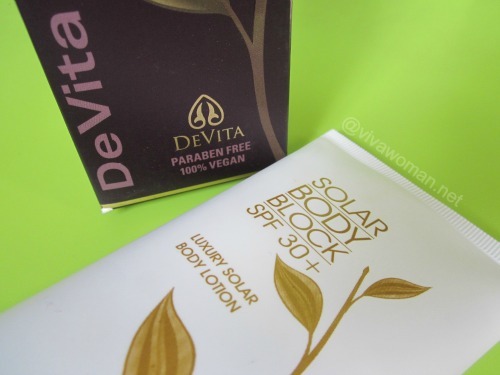 A number of you have been raving about this product – DeVita Solar Protective Moisturizer SPF30+ – so much so that I was tempted to try it. However, when I was in the mood for it, I found it difficult to purchase the item direct from the company’s website in US due to the high shipping cost. But good thing was that I managed to get it from one of my readers, Audris, who had ordered a few of this moisturizer last month from Vitacost. DeVita’s naturally formulated skin care products are paraben free, cruelty free and 100% vegan. 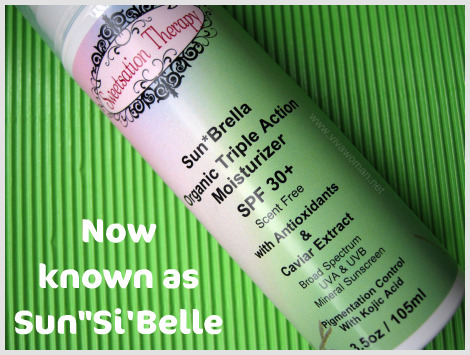 This moisturizer offers full spectrum UVA/UVB sun protection and is one of the company’s best sellers that has been consistently listed as a safe sunscreen in EWG Sunscreen Guide. It has also been given a rating of 3.8 out of 5 by 67 reviewers at Makeupalley. INACTIVE INGREDIENTS: Aloe barbadensis (organic aloe vera gel), Purified Water (aqua), Capric/caprylic triglycerides (derived from coconut oil), Glycerin (vegetable), Hyaluronic acid (vegan source), Glyceryl stearate SE (derived from vegetable oil), Stearic acid, Lecithin phospholipid, Tocopherol (vitamin E), Allantoin, Vitis vinifera (grape) seed extract. I like that it contains 19% micronized Zinc Oxide and no Titanium Dioxide. Other than that, the ingredient list look innocuous enough with no alcohol but various skin moisturizing ingredients such as vegan sourced hyaloronic acid. The texture of the product is creamy yet when applied, it does not leave any greasy residue nor whitecast but a transparent finish that feels just right. In addition, the moisturizer barely has any scent unless you sniff hard at it. So I can understand why many ladies love this one as it’s quite a challenge to find a Zinc Oxide based sunscreen that is lightweight and look cosmetically appealing after application. While it is possible to apply this alone, but I’ve been using this over a layer of facial oil and yet it does not make my skin feel oily even after a few hours. I also noticed that it does not leave my cheeks dry at the end of the day. The moisturizer comes packaged in a plastic tube; not the best for naturally formulated products as I prefer mine in glass containers or pump bottles but since this product is not retailed at a premium price, I’m not exactly complaining. But I was surprised to find the product indicated a shelf life of 24 months; I would have thought it should be 12 months at most for something without a chemical preservative. I have mildly sensitive skin and this product has worked well for me. However, based on some of the reviews on Makeupalley, there were a few who mentioned skin irritations from using this. But it also looks like others with sensitive skin have found it suitable for their skin so it really depends on individual condition. I know some of you are going to ask me how this compares with Marie Veronique Organics Moisturizing Face Screen SPF30. Well, while I concede that DeVita Solar Protective Moisturizer SPF30+ is lovely and it is more affordable, but my favorite is still the MVO Moisturizing Face Screen. The reason is because I find MVO’s ingredients more superior and I do like the whitecast on my face as it works like a base for me before applying makeup. In fact, the whitecast makes me feel like I’m getting better sun protection although I have to admit that this could be more psychological. But for those who tried MVO and did not like the whitecast or found it drying, then you’re probably going to like this DeVita one for it applies on perfectly. I would even go further to say it applies better than some of the chemical sunscreens. 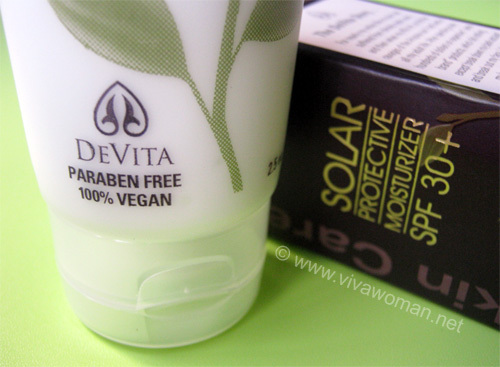 Even though DeVita Solar Protective Moisturizer SPF30+ is not my favorite, but I’m still giving this a full 5 hearts rating for it is a decent product. I read on Makeupalley that some ladies did not find this product providing sufficient protection and their skin still burn but that’s not something I can comment on as I didn’t take this out to the beach. Anyway, Asian skin do not burn as easily so that’s something to be aware of if you’re reading reviews about sunscreens. But this product is positioned as a moisturizer and not sunscreen so I think it is good to be worn daily to protect against casual sun exposure, like the MVO Moisturizing Face Screen and not to be used when you head out for outdoor sports. This product is not available in Singapore but you can get it at iHerb for US$20.40. The usual retail price is around US$26. So that’s a substantial savings plus the shipping also comes across reasonable to me at US$4. 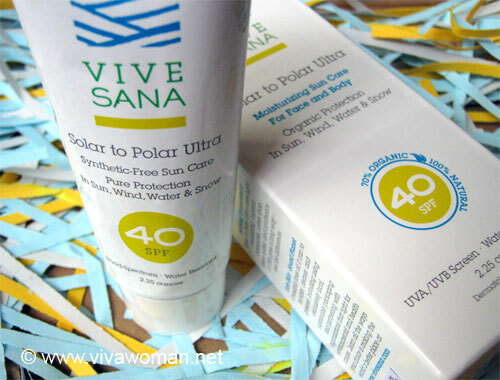 I may not get this product again but I’m likely to want to try their Solar Body Block SPF 30+ down the road. Previous Post: « How can a toner be used to hydrate our skin? Hong: They’ve changed the international shipping? Oh geez…gotta check it up…I last ordered stuff from them end of last year so have no idea. Sesame, pls help to confirm if the comments are indeed true. Appreciate it. Okay, Mai…I will try to check. I’ve been meaning to cos I want to replenish some stocks soon. I will update status on my Facebook later in the week or next. Thanks Sesame..this gives me more reason to lurk around in fb more often. Haha. Hong, you are right. I have confirmed with MVO that they are no longer offering free international shipping. However, I have worked out a shipping guide which gives you an estimate of the shipping cost. Helps you to decide if it is worth it. Click on my name for more details. 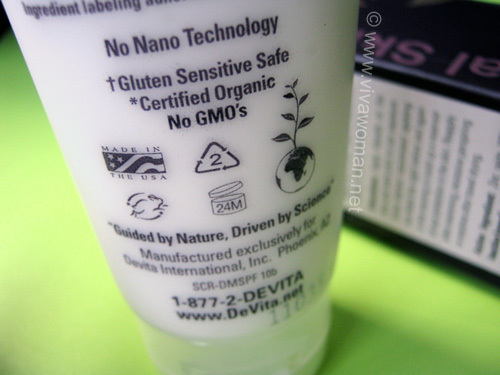 It seems that most DeVita products are gentle on my sensitive skin. Good to know it works well for your sensitive skin. Glad you liked it 🙂 It used to come in a glass pump jar but too many people complained. Hence the tube form. I do prefer the tube. I actually have the body version which I’m trying to use up. Not too sure what’s your stand on retinol in skincare for daytime, because the body version has it. Personally, I don’t plan on repurchasing it once I finish up the huge 180 ml tube because of it. Yeah, tube is beter than the jar. For the body block, I had no idea it comes with retinol. I avoid this ingredient as far as possible. Yes, this can be worn under makeup with no issues. I wouldn’t trust this if you are looking for real sun protection. I burned with this while I was walking my dog ( and I don’t burn easily) and others have said the same. I don’t believe this product has the % of zinc that it says it does because I’ve never burned with high zinc sunscreens. I know it’s tempting since it does have a nice finish (no white cast) but it doesn’t offer the protection it should with that amount of sunscreen. I also noticed it stung a bit when I applied and I don’t have sensitive skin. Even if only using it as a moisturizer there are still better options out there. So this product is too good to be true in my opinion. Hmm…interesting because I noticed that the older formulation had 14% Zinc Oxide but this one states 19%. The thing is I’m Asian and my skin doesn’t burn so easily and it’s not easy to tell. But I’ll definitely be cautious wearing this under the hot sun. Anyway, I’ll still stick to my MVO Moisturizing Face Screen. I’ve used that product since 2008 and I don’t see my skin getting worse so it must offer a good level of protection for me. I think the problem with this DeVita sunscreen is, because of its light texture, we tend to apply it too little. Sunscreen needs to be applied generously to give enough protection. Also, this sunscreen is not water-resistant, so reapplying during hot sweaty weather is a must. These are my own experience with both DeVita and MVO sunscreens. I think both offer good protection if applied generously. Hong: the good thing I found about DeVita’s is that it can be applied quite generously because it doesn’t come with the whitecast…and it’s not greasy so that’s a plus. I always apply sunscreen liberally. Usually more than the required and I wasn’t sweating at all. I think this is formulation-dependent (as Sesame pointed out, old 14% vs current 19%) and how susceptible to burn/pigmentation your skin is. I’ve worn this, applied very liberally and spent a few hours under the noon day sun at Pulau Ubin and to my surprise I didn’t burn nor turn red though I did keep dabbing at my perspiration to try to “retain” as much of the moisturiser as possible on my face. It was an impromptu trip hence the lack of a waterproof sunscreen. My male friend who was with me refused to put on anything and he got red. I usually use about the same 1.25ml or more blob of Devita on my face and ears, with some more on my neck. I’ve also recommended one of my very fair (think NC15) and pigmentation-prone friends the Devita and she has this on as a first layer, let dry, followed by a non-Aveonbenzone formula chemical sunscreen (LRP Uvidea) and she actually found it working for her with the double protection. I.e. her skin became clearer without the usual spots getting pigmented. Even her husband commented on it. Although on her normal-dry combi skin, she does find the Devita drying if layered without a HA serum or some other light serum under. So ultimately, everyone’s skin is different and we’ll just have to keep testing and trying to get what works best for us personally. Audris: Wow, your friend puts on DeVita’s and then LPR Uvidea? But good thing DeVita’s is not heavy so layering another product over is still fine. thank u so much for this review!!! i have been searching about tis products!! i’m from malaysia and there is no where i can find this product.. how can i purchase this devita?? and if buy online can shipped to malaysia?? It’s not available in this part of the world…you’ll need to buy online. Check out the link I gave…it’ll take you to a few stores for choices. It really depends on the skin and so different people have different mileage with the product. As for protection, I think the best is to double up with sunnies, brolly or even a sun protection supplement. I have just moved to Asia and am loving your site – thank you for all the info. I am debating whether to buy MVO tinted moisturising screen and use it as my every day foundation or to buy DeVita Solar to use as my moisturiser and continue to use my favourite foundation (Armani – which I’m sure has lots of bad things in it!) over it – would the latter option work or would the Armani some how counteract the active ingrdients in DeVita? It shouldn’t counteract…as for which moisturizer to get, it also depends on your skin type. MVO can be drying for dry skin type while Devita is easier to apply. I wonder if Zinc Oxide based sunscreen safe to use? Yes, it should be safe but it can be drying for some skin types. Thanks for the recommendation, Sesame! The ingredient list looks very good and the SPF seems sufficient for indoors. I think I’ll order one to try. 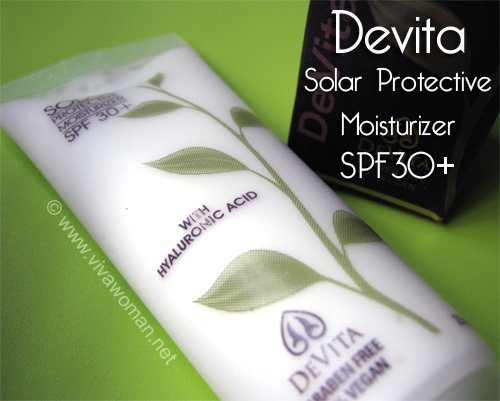 Isn’t Devita Solar Protective Moisturizer water resistant? I tried a simple test given in a book to drop a pea sized amount into a cup of water, and it coagulated and didn’t dissipate after stirring, which indicates good water resistance. That’s an interesting experiment! I’m not sure if it’s water resistant…if my memory serves me right, it was not indicated on the packaging. If it’s not, perhaps it wasn’t tested for that purpose. not sure if you already know by now but I found a local site selling this. eviva(dot)com(dot)sg. I’ve just bought this but yet to try because I want to finish up the Vit C one that I bought from the bodyshop. Yes, I know they carry but I did not get mine from them.